You must have probably come across many anti- dawdling apps like WasteNoTime, Stay Focused on the web. These apps helps you stay focused and increase productivity by blocking time wasting websites or showing up the time you had wasted. That’s because we generally think, if these online distractions are avoided, you are most likely to be productive. 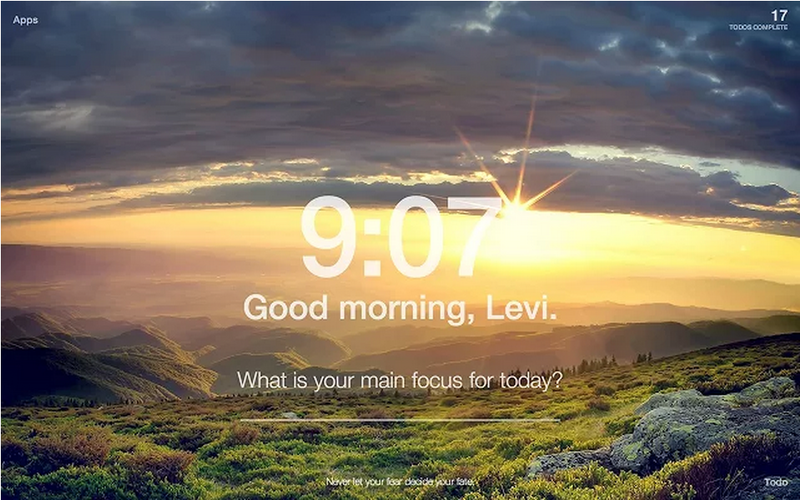 But Levis Bucsis has come up with an app to make you stay focused but with slightly different approach. This Chrome App, is called Momentum! Which replaces the new tab page of your Google Chrome with your to-do list. Not only that, you will have a personalized message highlighting what should you be focusing for the day with some new mind refreshing image at the background every single day. So every time you launch Chrome, or open a new tab in the browser, this extension works as a reminder with a clock ticking away. This will help you to stay focused on the more important things. This entry was posted in technology and tagged Google Apps, Google Chrome, Google Chrome extension, increase productivity, Levis Bucsis, momentum app, new apps, Online App, online distractions, productivity app, Stay Focused. Bookmark the permalink.